Your A-Board, also known as an A-Frame, Sandwich Board Sign, or Pavement Sign, is an important component in any public-facing businesses. It highlights special offers, or special instructions you might require for your visitors. While it is certainly convenient to have an a-board, it could have a substantially increased value to the business if you invest a bit of thought, into your a-board message. Below are 4 seemingly obvious points when placing and messaging your business a-board, but they often get overlooked. The most important factor is deciding to use an A-Board is what information are you sharing with your customer. A-Boards are used to highlight information about your company, details of your menu, special or seasonal offers that potential customers should know about. Make sure the a-board makes purposeful information clear! Unnecessary details of your business presented on the A-Board will end up either ignored by the prospective customer at best, or confused in the minds of the prospective customer at worst. Sharing as many details as possible, rather than sticking with only what’s purposeful, is a mistake that can significantly reduce the value your A-Board to your business. The A-Board is generally not the place to put extraneous details about your organization, or your offer. It generally exists as initial calling to prompt the visitor to enter your establishment for additional information. Your A-Board should be placed in a location that makes it very clear what establishment is being referenced. It should be positioned in a sweet-spot that doesn’t become a stumbling block to pedestrian movement ( councils enforce this ), but also doesn’t go unseen in the eyes of passers-by. It is a good idea to place the A-Board at an angle. This provides a bit more of a standout in the visual field of those walking by, compelling them just a little bit more to stop and look at what isn’t lined-up. The A-Board itself should have a clear sign or arrow pointing in the direction of the establishment, with clear directions and address as well, if not directly outside the business premises. As much as possible, keep the text on the A-Board bold and colourful, and add appealing images or pictures when possible. This provides more sensory information to connect viscerally with those who pass by. The A-Board should be eye-catching, compelling them to inquire further. Adding branding to the board, in the form of a header, will increase the branding message of the business, as well as the message. If you regularly use an A-Board as a marketing aid, consider changing up the contents regularly. This will encourage the passer-by to regularly pay attention to the board and the message. If you have daily or weekly specials, make sure you change the board to reflect these. If you have special events occurring for a fixed duration, update your board with a calendar and agenda. If your business will be unavailable for a duration of time, make that clear. In addition to the latest specials for instance, add something that is of value to the passer-by. This could be either educational or entertaining. Consider regularly rotating your board with new artwork or photography, various words of wisdom, or whatever might pique the interest, emotions, or curiosity of the person strolling by. Creating a marketing or informational posting via an A-Board might very well be a quick and simple means of increasing exposure for your product, service, offering, or event. With these strategies, and just a little bit of additional thought and consideration on your part, you can significantly increase the value and impact that your A-Board will have on helping your business succeed. 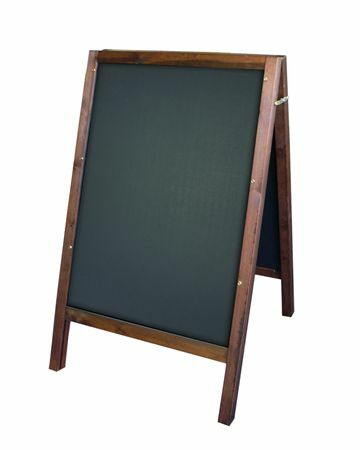 Essentially there are two types of A-Board displays available – a chalkboard a-board, where you would write your own message, and a poster a-board, where you would slide in a poster. There are multiples of designs and styles for these two types of a-boards, metal or wood, round topped or square, branded or non branded. 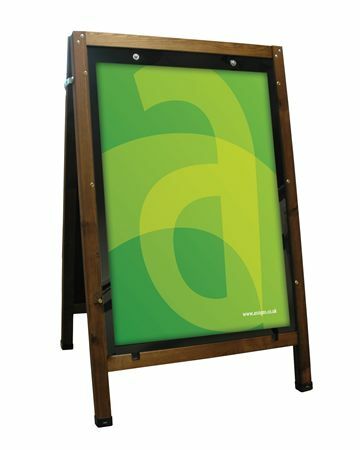 At Assigns we offer the highest quality Chalkboards and A-Boards on the market, with a range of products to suit every need. Whether you’re looking for a standard A-Board design or a more quirky Chalkboard frame or easel, our products are built to the highest standards. To discover more about our Chalkboard and A-Board display products, give us a call on 01462 672000 or send us a message through our online enquiry form. Danny Chard is the Managing Director of Assigns Point-of-Sale and Graphic Display Systems in both standard and customised formats and sizes. Our range of Retail Display Stands are designed to enable retailers to get their products and services noticed on all levels, whatever the retail environment.